Linda K. Jenness, MSW, LCSW, is used to wearing many hats and playing a range of roles—a distinct advantage for a social worker employed at The Lillian Booth Actors Home of The Actors Fund. Among the 124 residents in this state-of-the-art assisted living and skilled nursing facility are talented singers, musicians, and actors as well as behind-the-scenes professionals from radio, television, film, and theater, all of whom have spent a significant portion of their lives as entertainment professionals. Just one of the many missions of The Actors Fund, a human services organization dedicated to providing programs to entertainment professionals in crisis, The Lillian Booth Actors Home provides affordable residential care on a 6-acre site in Englewood, NJ, just across the river from New York City, the epicenter of the arts. Jenness says the specialized training social workers receive is put into play in this setting. Among the most important assets she brings to this environment are rapid assessment skills and the ability to advocate, which helps the residents and also benefits the staff. She leverages her training to educate staff members on the social work perspective, helping them to better understand the impact of dementia and diminished memory and cognitive abilities on their aging charges. And social work’s ethical values guide her in ensuring that residents are treated well, validated, and respected, which she sees as her chief responsibility. It takes many types of skilled professionals to keep the aging residents at their best, including nurses, administrators, physical therapists, and activity directors. But social workers are the only staff members whose biopsychosocial approach lets them view the whole person, not merely a particular need or function of that person, Jenness notes. 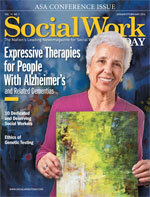 The social work component is “the oil to the machine,” she says. “The machine functions on its own, but the social workers smooth things over, make transitions easier, and forge the communication between departments, holding the team together”—all of which sets the stage for advocacy. For residents aging in place and developing more cognitive issues, Jenness says it falls to the social worker to stand alongside them and influence institutional changes on their behalf. She cites a new initiative designed to provide comprehensive care as an example. “We have tried to fill the cracks as well as we can, but sometimes things have fallen in between,” she says. But in about a year, construction will begin on a new enhanced assisted living wing of the facility for residents who may be capable of performing activities of daily living but need support for increasingly severe cognitive issues and memory impairment. “It will be specifically designed to meet their needs because of the advocacy of social workers,” she says. Although residents of this home have the advantage of common interests, they are as vulnerable to isolation, disorientation, and depression as others in assisted living. The social work perspective underlies all the crucial assessments and interventions that ease their transitions and minimize the trauma. Most of these interventions are necessitated by the difficult adjustments associated with leaving one life behind and moving into another. “Coming to the home is another possibly traumatic step these individuals take in their lives, and it’s crucial to have someone alongside them to offer support—someone who’s trained in end-of-life issues, knows how to advocate for community resources, and can tailor interventions to each person’s specific needs,” Jenness explains. “A lot of the time—most of the time—we work on coping skills, validating residents’ experiences, and letting them know it’s OK to feel scared and worried, and demonstrating that they have someone here to help them through it,” she adds. Newcomers have to live with people they don’t know, and it can be hard for them to navigate the new environment and form new relationships. “We work with modeling good behavior and positive relationships and helping them get along with strangers,” she says. The staff at The Lillian Booth Actors Home works with the residents to take initiative and think creatively and outside the box, according to Jenness. She recalls the time she started a support group in which residents could discuss emotional issues, thoughts, and feelings—not an unusual move. But the residents, who found they had similar concerns and desires, in turn started a committee, which resulted in a meeting with administration that kick-started significant changes to enhance residents’ lives. “This team effort, as opposed to a bureaucratic style of running a home, gives the residents some self-efficacy and ownership. They feel that this is their home and they have a say,” she says. Though the residents of The Lillian Booth Actors Home may be film producers, opera singers, and jazz musicians with riveting tales to tell, and while their visitors may include not only their family members but also the leading lights of Broadway and film and television celebrities, they experience the same traumas and challenges of aging and life transitions as do elders who have had less glamorous careers. But this elder community, like others, still is powerful and important. “They have many gifts, talents, knowledge, and life still to give. To be able to support that is unique and special,” Jenness says. Working in this setting isn’t without its lows. Like anyone who works with elders, Jenness is no stranger to loss. In the past, she worked with individuals with HIV, so she’s always had to grapple with the emotional repercussions of losing clients whose lives she has shared. But she tries to focus on the positive. Despite the sadness she feels when residents die, she can recall the tender moments they shared and take pride and satisfaction in knowing she helped them have better days. “If we did our job here, we made sure their last years are wonderful and supported,” she says. Along with the achievements, Jenness acknowledges the limitations: “I learned the first day in social work school that you’re a social worker, not a miracle worker, and you’re here to help as much as possible.” At The Lillian Booth Actors Home, as in all settings, she says, “We can only do our best, and it may not be enough to make all the difference we want to make, to satisfy all the needs, or create all the change that’s necessary. All we can do is stand by and walk with someone and walk on their journey,” aware that is, in itself, profound and powerful.